In the last post, we left poor Susannah Holmes on 5th November 1786 at Plymouth, having arrived there with her baby, a third Henry Cabell (she and her man were as imaginative about names as most others of the time), en route to Botany Bay. She was amongst the female felons awaiting transportation who had been selected for inclusion in the first fleet headed to Australia. At the very last moment, someone had realised that an all-male group would be unable to cope long enough to get this new penal colony established, let alone act as the nucleus for the further emigration and settlement that would establish a fresh outpost for the British Empire. Now Susannah and the two other women with her were put aboard the prison hulk “Dunkirk”. Susannah’s baby was refused entry because there was no mention of an infant in the orders to the prison hulk’s captain to take the women in charge. It seemed Susannah’s young life was to be blighted by yet more heartbreak and misery, as she was led away, cursing the captain and vowing to commit suicide at the first opportunity. What happened next sounds more like a Hollywood film script than the grim reality of dealing with criminals in Georgian England. The escorting warder, John Simpson, had fulfilled his duty by handing over Susannah and the other two women. Most would have left it at that and headed back to Norwich. The baby would be either abandoned at once or disposed of somewhere convenient along the way. Instead, John Simpson took the baby into his own custody and left at once for London, travelling with the baby on his knee and feeding it as best he could. He was determined to go to the top – the Home Secretary, Thomas Townshend, Lord Sydney – to get the matter sorted out properly. Of course, when he got to London, Lord Sydney’s servants turned him away, but still he refused to give in. Somehow, he got into Sydney’s house unseen and literally waylaid the great man coming down his own stairs. Mr. Simpson was denied admittance, but in vain, for he pressed forward into one of the offices, and told his story to one of the secretaries who attended properly to it, and promised to do all in his power to promote the object of his humane petition, but feared it would be impossible for him to see Lord Sydney for several day; he begged however of this gentleman to prepare an order for the restoration of the child, and determined to wait in the hall for the chance of seeing his Lordship pass, that he might prevail on him to sign it. Fortunately, not long after, he saw Lord Sydney descend the stairs; he instantly ran to him. His Lordship very naturally showed an unwillingness at first to attend to an application made to him in so strange and abrupt a manner; but Mr. Simpson immediately related the reason for his intrusion, and described as he felt, the exquisite misery he had lately been a witness to, expressing his fears, least in the instant he was pleading for her, the unhappy woman, in the voidness of her despair, should have deprived herself of existence. Simpson must have been a very persuasive advocate, for Sydney at once sent him back to Norwich with an order that Henry Cabell, the baby’s father, should be included in the list of people to go on the same ship as Susannah. So Simpson went to Norwich, collected Cabell, and returned to Plymouth with him and the baby on November 15th, carrying orders from the very top to have the family united for the trip to Australia. All this got into the newspapers. Indeed, a mob of interested people, including journalists, had followed Simpson to Lord Sydney’s house to see what would happen. Now several prominent gentlemen, sensing the public mood, wrote to Sydney expressing support for his prompt action to reunite mother, father and child. Amongst them were several of the leading gentry of Norfolk, including Sir Harbord Harbord MP, later Lord Suffield, and one of the Wyndham family of Cromer Hall. The London newspapers all ran the story and a Mrs Jackson of Portman Square organised a collection to buy household necessities for the family to take with them, raising the impressive sum of £20.00, which was spent on clothes and other goods for Susannah, Henry and their child. She also seems to have asked the First Fleet’s chaplain the Rev. Richard Johnson, to keep an eye on the young couple and their goods during the voyage – a request which may have changed the history of Australia. Simpson, the Norwich turnkey, was labelled a hero. Lady Cadogan sent him six guineas ‘for his great humanity towards the poor female convict (Susannah Holmes) who was refused the indulgence of taking her infant child with her to Botany Bay’. The country happily congratulated itself on ‘the spirit of British humanity’ and ignored the fact that these young people were being sent into the unknown with no hope of ever returning home – if they survived at all. At the Cape of Good Hope, the captain of the “Friendship” had had enough of the problems his female convicts were causing him by their “lewd behaviour”, so he had them distributed to other ships in the fleet, and replaced them with 30 sheep. 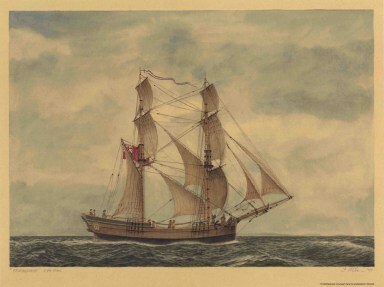 One of the marines wrote in his diary: “I think we will find them more agreeable than the women.” Susannah and her son were therefore put on board the “Charlotte”, while Henry stayed where he was. The fleet reached Australia in January 1788. Susannah, the baby and Henry all arrived safely and were reunited. At last Henry and Susannah were married at Sydney Cove on 10 February 1788 in a group wedding: the first wedding ceremony held in the new colony and land of Australia. Unfortunately, the parcel of goods bought with the collection made in England, and intended to assist them in beginning their new lives, was missing. The captain of the “Alexander”, Captain Duncan Sinclair, flatly denied all knowledge of its whereabouts. It seemed Henry and Susannah’s luck had deserted them.